Futures 2040 is a guide for transportation and mobility decisions made for Topeka and a surrounding portion of Shawnee County while ensuring continued federal funding assistance in the years to come. Updated every five years by the MTPO, the plan models future growth scenarios and identifies needs for roadways, public transit, bikes/pedestrians, aviation, and rail through the year 2040. In September of 2017 Topeka was awarded two grants from KDOT for transportation alternatives totaling $1,083,820. Of this, $803,820 is for Phase III of Bikeways Master Plan, which will allow for an additional 10 miles of infrastructure. The plan includes creating bikelanes and "sharrows" (share the road signage). An additional $280,000 will go toward ensuring that complete streets are available for students and families to walk or bike to school in the Quincy Elementary area. Data on bicycling and walking was collected on September 13 & 16, 2017. This data assists City and leaders with estimating usage and demand for bicycle and pedestrian facilities. 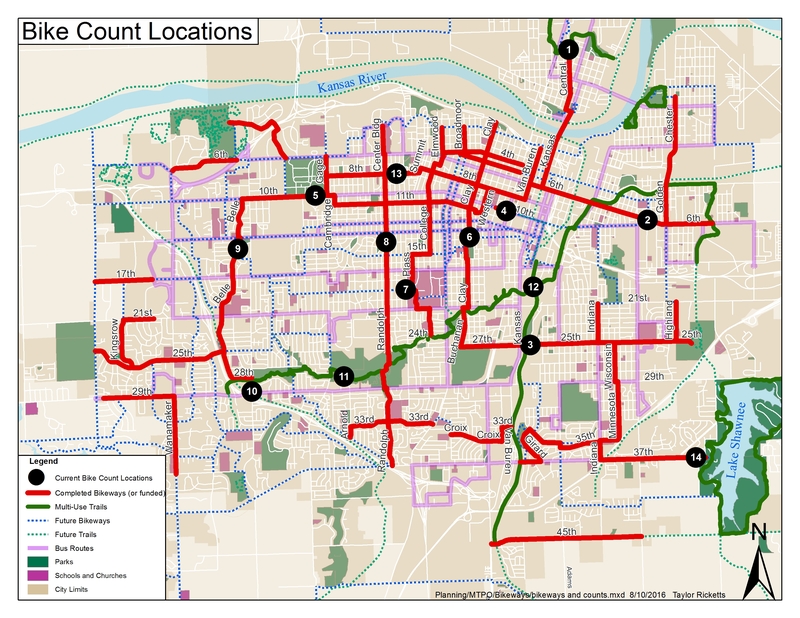 The counts are also used to track the city's progress on increasing the use of non-motorized transportation, evaluate existing projects, and more. Click below for information from 2013-2017. This plan will identify emphasis areas of focus, determine specific strategies to reduce severe crashes, empower local Engineering, Enforcement, Education and Emergency Services (4-E’s) to implement those strategies, increase awareness and decrease severe crashes in the Topeka/Shawnee County MTPO Region.